Ken Wenzel was born in Brisbane in 1930. He commenced painting at the age of fourteen, using paints left to him by his mother who had painted as a hobby. At the age of fifteen he won the Sunday Mail’s children’s art competition as well as a ‘Highly Commended’. The same year, Ken began his first job, painting costume jewellery. This remained his principal source of income for several years. During this period he won first prize in the R.N.A. show for four consecutive years. Always motivated to improving his artistic skill, he used his spare hours painting to satisfy his ambition to create beauty with his brushes and paints. 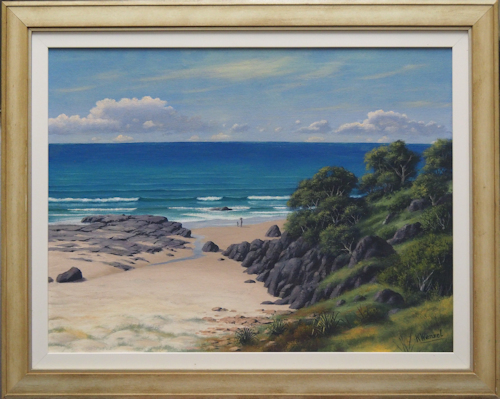 He is a nature lover with a deep affection for the Australian landscape and coastline, which he captures on canvas in minute details. His particular ability is to render the interplay of light and shade in his work. 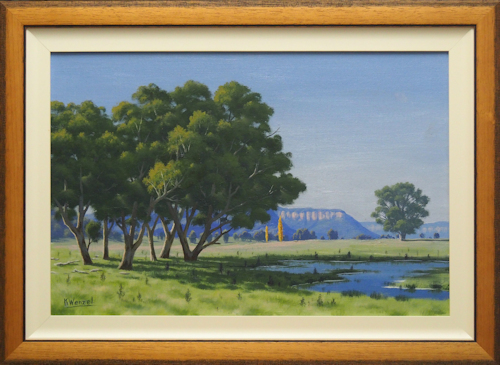 Ken began life as a full-time professional artist in 1974, and retired at the end of 1993 following a very successful last exhibition at Montville Art Gallery. Ken Wenzel lives on the crest of the Conondale Range near Maleny.